Tarantino's inspiration for Jules' "Bad Mother Fucker" wallet was the fact he actually owned one prior to writing the script. On the face of it, for someone who courts the populist opinion, this can't have helped him. But then again, this is America. As a businessman he may well have deemed that there's enough Americans who have had their fill of 'the rights of blacks', to get their vote. He's playing the demographics. Who is he going to upset the most? There's five times as many white Americans than black Americans. After that it's just statistics and stereotypes. There's five times as many white Americans than black Americans. https://www.cnbc.com/2019/01/17/trump-loses-support-among-core-voters-as-the-shutdown-drags-on-polls.html but he alienates the vast amounts of White College. I asked Google for the numbers. A bit of cross checking gave me enough information to avoid pure guesswork. The tipping point for Trump is when (likely) he loses his base support. Now I'm sort of guessing with this one, but that could happen when he fails to do something extreme enough to keep the 'Jeremy Kyle' types satisfied. The irony will be that Trumps epitaph could be that 'He was a horrible guy who wasn't horrible enough'. For me he fits into the category of ignore and wait. He'll be gone. One day. Though that has much in common with the Japanese game show Endurance. 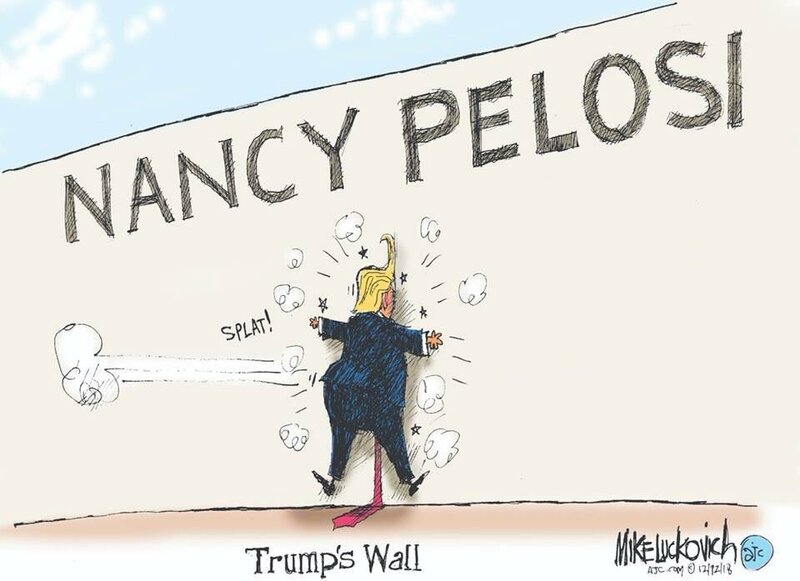 Pelosi's more than a match for the Orange Manatee. An NBC-Wall Street Journal poll showed that by 63 percent to 28 percent , a margin greater than two to one, Americans believe the country is "off on the wrong track" rather than "headed in the right direction." As the sage Nelson Muntz would say, "Ha ha!". Trump doesn't know what it's like to live from paycheck to paycheck. That's one problem. The bigger problem is that Trump cannot make America great again. No one can. The factors which made America what it was from 1870 to 1970 will never happen again. The situation where no one really had much of anything created an opportunity for all to make some money. However, once the money had been made, the only industry left seemed to be one where that money was gradually leached from the many to the few. Since Trump has a part of that deal, if he doesn't succeed in his claims, he'll be gone. The masses will only endure so much disappointment. Trump doesn't know what it's like to live from paycheck to paycheck. Daddy gave him a combined total of $415m (it wouldn't take Warren Buffet to turn that into a few billion) whilst 61% of Americans don't have enough savings to cover an unexpected $1,000 bill. His sheltered and privileged existence leads him to believe that all US folks have to show an ID card to purchase groceries. Do you reckon he knows the price of a loaf of bread or a gallon of petrol? Ynnec, that privileged start and subsequent detachment will be the undoing of him in the end. I mean, I'm solvent in a much much lesser way, but I know what it's like to have a pay rise wiped out and more by a rent rise, and to have other third parties taking 'their share' of my resources. I fixed it. But had the opportunity to do so. The masses in America and here in the UK are not so fortunate. Trump had better be aware of that. My feeling is, he isn't. Interesting to know what his understanding of the average American's financial status is. Statements like that make a compelling case for secularism. Mohammed Ali reckoned the white man was the devil. There maybe at least one. Day 745 of his presidency and an approval rating of 39.6% - lower than any other president during the modern era at this stage. I think she misunderstood when so many people treated the news of his election with ""Oh my god......"
Trump demonstrates the dangers of populism. People demand long term stability but exist in bubbles dominated by impulse and appetite? With social media and high speed means of communication, they are able to make decisions in haste all the time. The problem is that the time frame described as 'haste' has reduced from about a month, down to the time it takes to post on 'Twitter'. Knee jerk reactions to the serious business of governing the USA has condensed into a single jerk! Threats to withdraw from the WTO and the trade war with China have major worldwide implications. Withdrawal from the Iran Nuclear Deal (in direct confrontation with EU leaders) and removal of troops from Syria and Afghanistan threaten Middle East stability and promote the resurgence of ISIS. Withdrawal from Paris Agreement on climate change - self explanatory. Withdrawal from Russian missile treaty and threats to withdraw from NATO - self explanatory. His continual deference to Putin, Kim, Erdogan and Duerte is disconcerting. His baiting of leaders of countries who've been historical allies is damaging to say the least. Stuff like that should concern us all. This Ric person doesn't realise that some of us might know (and remember) more than he thinks we know (or remember). The problem with constructing an online fantasy life is its disappointing habit of being tied, inexorably, to the real world. Agreed. 'Y' This is serious stuff. Is the guy trying to take the US back to the 1950's? I confess to being fuzzy on the dates when the US signed up for these things, but is there the possibility he thinks he can make America great again by ditching things that weren't there then? Says something which has neither name nor face. It's a what? Deary me. Does it really matter that much? He's an egotistical business man with questionable hair who posts impulse comments on Twitter. Why hate him. What difference does it make? You don't half flip-flop and contradict yourself, Ric. Says something which has neither name nor face. To be fair, these forums aren't strictly "Social Media". There's no expectation/obligation to reveal personal details, tell people how you're doing on Candy Crush and broadcast the number of bowel movements you've had during the day. It doesn't matter. People hiding behind pseudonyms has a lot to do with it. Take a look around the multitude of threads on these forums. Very few peeps use their actual forename/surname combo as Usernames. I mean, even you don't. None of this stuff has any value beyond a vicarious thrill. I got mine the hard way. Jobs where you could get hurt, maimed or killed. If I was presented with having to go through it all again, I'd top myself. Trump hasn't exactly got his hands dirty. His wealth is a nice fat cushion against everything. What I have is security against the agencies determined to strip you of everything you have. Jobs where you could get hurt, maimed or killed. Looks like a tentative deal has been reached between Democrats and Republicans which includes $1.37 billion for border fencing, as opposed to the $5.75 billion Trump wanted for border wall construction. A wall seems a bit extreme. It won't work anyway unless they bury it down 100 feet. 95% of the drugs from Mexican cartels come in via the sea. Illegal immigration reached a peak in 2000 and has decreased ever since.